So what did bring us to Pinehurst? We are often asked that question by the folks we encounter here. We know what you are thinking way out there in cyberspace: that Bill and Lisa moved to the Sandhills solely for the golf. Yes, we have had a blast playing these wonderful courses. We teed it up at legendary Pinehurst Number 2 ten times this past winter! Surely, there is no better course to walk and savor the game. But the Village of Pinehurst offers far more. It is simply beautiful! The "Old Town" section where we will be living evokes the look and feel of a historic New England community. "Quaint," "charming," and "peaceful" are overused words that nonetheless come to mind. The welcoming porch of the "Villager Deli Restaurant" is a great place to grab some breakfast. The Villager is a three minute stroll from Rose Cottage. The Carolina Hotel, one of the south's and golf's leading resort hotels, is about a four minute walk for us. The Pinecrest, Holly (below) , and Magnolia Inns are all over a century old. They are restful havens that slow the pace for their grateful guests. The Given Library (below) is also close by. The library houses the Tufts Archives which include renowned golf architect Donald Ross's plans and drawings of many of the famous courses he designed. Given my interest in learning and writing about golf history, I have already spent considerable time in the archives perusing Ross's correspondence. So we knew we liked the look of Pinehurst before we moved. However, we did not anticipate how friendly a place this is. The first time we played Sunday couples golf at Pinehurst Country Club we met Frank and Debbie Marois who promptly invited us to their family's Thanksgiving dinner. In short order, we met their friends the Walkers, Janaseks, and Greens who graciously included us in various activities. Neighbors to be Doug and Nancy Smith sent us an invitation to their neighborhood Christmas party though we were still months away from moving into Rose Cottage. There we met Jim and Char Rohr. Jim, the world senior hickory club amateur champion, asked me to play with him in a hickory club event. Char took Lisa under her wing too. While checking out work on the cottage, we met Sharon Lawson on the street. In short order we were enjoying dinner with her and Carnie. Richard and Barbara Mack, off one chance meeting at the Villager, befriended us. Most everyone comes from elsewhere- New York, Pennsylvania, Illinois, even California. Our sense is that these transplants remember the heartfelt greetings they received when they moved to Pinehurst, and they like to pass on the good karma to others who follow them into town. Another unexpected amenity is the Village Wine Shop-only 70 yards from our property. Proprietor Gwen Detering hosts great wine tastings that seem to break out on a nearly daily basis. We attend regularly. This is a perfect place to relax and make new friends (Deborah Mabry, Gwen and Lisa Anderson below). Despite the social whirl, the renovation of Rose Cottage remained our primary focus from the time we arrived in October. 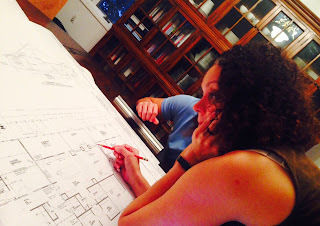 Our general contractor Yates Hussey and designer Priscilla Bailey skillfully guided us through a bewildering maze of renovation decisions. Lisa and I originally contemplated limited modifications to the upstairs rooms (the existing floor plan when we bought the house is shown below). The master bath was definitely antiquated, but Lisa thought we could "live with it" for now. We thought Bathroom #2 would be adequate for guests. Tiny Bathroom #3 barely provided enough room for a small bathtub (no shower; see below). We gave thought to eliminating that bath altogether and substituting storage space. Another oddity of the prior design was Bedroom #4 just off the master. It was really small: we surmised that it might have served as a nursery for the Razook family in an earlier time. A couple of days after inspecting the cottage, an excited Priscilla (below) called Lisa. She had brainstormed a prospective design change that would vastly improve the livability of the upstairs space. Priscilla's proposed changes were threefold: (1) expand Bathroom #2 by adding adjacent hallway space; (2) eliminate Bedroom #4 altogether, by knocking out a wall separating that space from the master closet thereby creating a generously sized closet that would easily accommodate our respective garb; and (3) eliminate Bathroom #3, by adding its space to the adjacent small closet thereby creating some excellent storage space (Priscilla's redesign is shown below). We were thrilled with her concept. Losing the miniscule third bathroom did not seem that big a deal since Bathroom #2 would be much grander than before. We signed off! By doing so, we had agreed to a major expansion of the work. Oh, that means more money, doesn't it? Oh well! Before any construction could take place, the cottage required substantial clean-up. Residue from squirrels etc. that had previously taken unimpeded residence in the attic had to be eliminated. This proved to be a big job. To accomplish this, we learned that the ceilings in several of the bedrooms and the master bath would need to be gutted. Big Tom Wilkes and the "hand labor" crew removed truckloads of material. Once that was done, we realized that it made little sense to postpone renovation of the bathrooms. We would just have had to tear everything up again at some future time. So renovation of the bathrooms would be chalked up as another big add-on to the project! Yates (below) alerted us that all the gutting presented an "opportunity." He advised that "blown in" insulation would be the best way to stop heat loss in wintertime and keep the rooms cool during the sizzling Carolina summers. But, (no surprise), that would further augment the expense of the rehab. But Yates assured us that over time our heating and cooling savings would offset the up-front cost. So, blown-insulation it would be. At the outset, we naively thought we could get by with the cottage's ancient "knob and tube" electric wiring. Electrician Jeff Clark set us straight on that. It would have been unsafe not to replace all of it. Expensive? Of course! Meanwhile carpenters Billy and Frank Barnes, Harold McNeil, and Pat Flemming were busily engaged in the build out of the relocated kitchen and other areas of the downstairs. Below, you can see the initial frame-out of the kitchen. The railing below is the "peninsula" that would separate the flipped breakfast room and kitchen. The master bathroom began to take shape as well as witness the view below of the master-shower. We were continually amazed by the ingenuity of our carpenters. Their attention to detail never failed to impress. We recall Harold, who while framing the upstairs bathroom, fretted about how to do so while making room for a toilet paper dispenser. Billy (below with Lisa) and Frank (second below) were forever fabricating solutions to predicaments that appeared to us to be intractable. Planning ahead, Lisa worked with Jamie Frye to select counter-tops, cabinetry, and floor materials for the kitchen. If that was not enough, our decision to redo the upstairs bathrooms geometrically compounded Lisa's decision tree. Lighting fixtures, toilets, and sinks all had to be chosen. I helped some, but I must say Lisa did by far the lion's share of the work. The selection process could be exhausting for her at times (as seen below with Polly). Lisa found the best bargain for purchasing bathroom cabinets was offered by Restoration Hardware. She rushed to place her order in time to qualify for a $1,000 discount that was about to expire. This caused carpenter Harold McNeil to remark, "The more you spend, the more you save!" This pithy non-sequitur became the unofficial motto of our renovation efforts. Priscilla Bailey suggested a change to the foyer off the front door: widen the entrances from the foyer to the dining room and back hall. We saw how opening up these areas would help flow into and out of those areas. Done! Once the wall had been knocked out between the storage closet and Bathroom #3, Lisa saw the resulting space in an entirely new light. Maybe the larger space would make a decent-sized bathroom after all! And yet another change order came to pass. Who's counting?! Sometimes leisure time pays off. Our operating assumption had been that we would be forced to use propane gas as our heating source. But while golfing with village resident Bob Mosbrook, I learned that natural gas had been made available to some areas of the village. I followed up with Piedmont Natural Gas and discovered that the company already had a line serving the Magnolia Inn (below) next door to us. Piedmont's representative greased the skids to allow us to tap in. Yates (with Lisa below) convinced us to install gas in the two fireplaces. Soon, subcontractor Roger Locklear and crew mounted sheetrock. and Randy Flinchum (below with Lisa) busied himself with the plumbing. We also repurposed the old kitchen sink. It found a new home in the laundry room. Yates advised us from the get-go that proper fitting of cabinets was critical and any miscues in achieving that result would cause a commensurate delay in the completion of the work. Fortunately Jim Shealy, our cabinet man,(below) performed his work flawlessly. With cabinetry, counters, and tile all in place, electrician Brian Dominie hung the kitchen lighting fixtures that Lisa had chosen. After an initial misstep in lining up the stripe on the shower wall with the one on the floor, the tiling in the master bath (to Lisa's relief as seen below) was finalized. We were so immersed in the details of the work that we did not always check out the view of our backyard. When we finally did one beautiful spring day in April, look at what we saw! The refinishing of the heart pine and oak floors was the last major milestone on the critical path. Subcontractor Tom Denza (below) was the man in charge. A miller had repurposed the wood that had served as the cottage's floor joists into floor boards. When we got our first look at this newly milled " yellow gold" (see below), we could barely contain our unbridled delight. Tom's crew used these boards to lay a new wooden floor in the downstairs hallway (see below). On May 9th, I took a peek inside the front door and gazed at the refinished floor in the foyer and great room. WOW! As I write this posting, we are approximately 10 days away from making Rose Cottage our new home. It has been a long but fascinating journey. Next Chapter: Hopefully we move in and have a very happy ending!